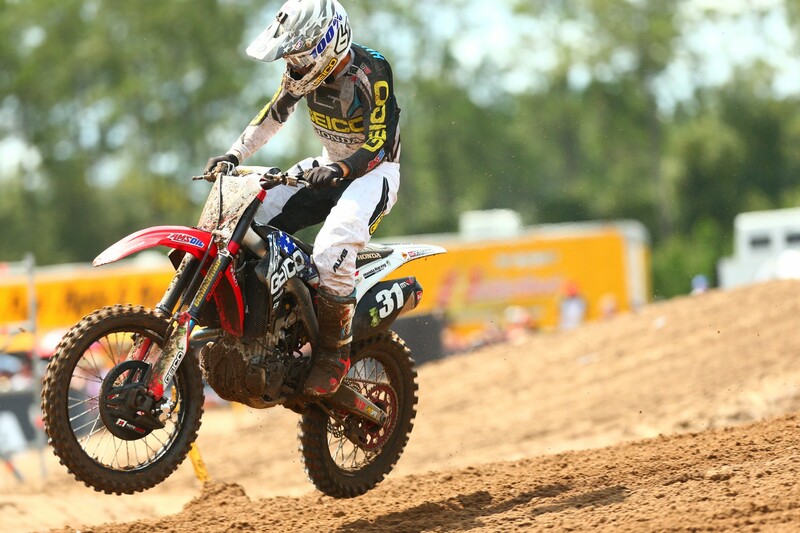 GEICO Honda’s RJ Hampshire went 1-1 on Sunday at the MXGP of USA at WW Motocross Park just outside Jacksonville, Florida, to claim the MX2 overall over Australian Hunter Lawrence and fellow American Thomas Covington. It wasn’t a walk in the park for the Florida native, though, as he crashed late in the first moto and had to hold off Covington. In the second moto he was caught late by Lawrence and Jeremy Seewer, but once again held on to capture the win. We spoke with him after the race. 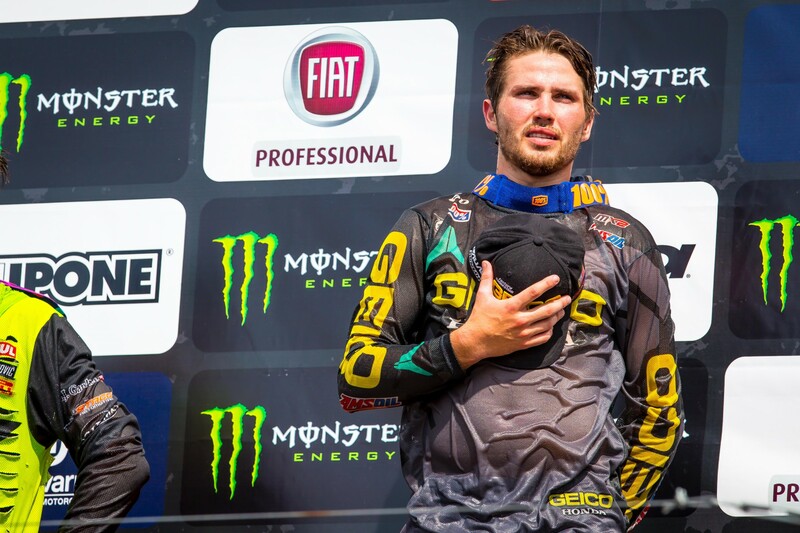 Racer X: The winner—MXGP USA winner. Nice work, 1-1. First of all, there are so many myths with you and this track. How much have you ridden here? RJ Hampshire: I’ve rode here once. Remember it was Jordon and I, we did that big video shoot? It was literally amateur days. That’s the only time I ever rode here. I heard that you’d ridden here a few times. I heard you hadn’t ridden here at all. So, we know, one time? One time, man. Literally it was when the track was just built, so there was no clay, nothing. It was still sweet, but it was nothing like this. Topsy-turvy weekend. Yesterday [Saturday] motor blows. You have one of the last gate picks, and it stays for both motos. But today you got the starts. I understand you went inside first moto and outside the second moto? I was starting from yesterday in practices, it felt like I was on a stock bike out there. I came back, I’m like, we are not even competitive right now. I was kind of worried. I’m like, we’re struggling to get in the top 10 right now. Those guys are no joke. They were going for it. Then we tried leaning it out. We leaned it out quite a bit for that race, and as soon as I took off the gate it started spinning and sputtering. So, I was like, man, I need to salvage it for a gate pick. Then two to go she went completely. So then we came back, new motor, new electronics. I had my spare bike. So, we showed up today and in the warm-up I rode both bikes. It was the one that I didn’t ride yesterday that I liked more. But our plan was to ride that bike one moto and the other bike the next. Yeah, we weren’t doing that after we won the first one. I was like, dude, we ain’t touching this thing. So, what gate pick did you end up having? I think I was 38th or 32nd or something like that. There was one guy after me. Dakota Alix who missed his gate yesterday. That was first moto. The first moto we had two guys behind me. Last moto I only had one. But I seen him first moto, because I was outside but not as far outside. He was three bike lengths ahead of me, so I was just praying no one took that. Talked to Ziggy and he’s like, “Man, whatever you think.” He was hoping I took it, and if you watch the gate, I jumped out and I went straight right. Caught that grass. [Justin] Hill almost beat me to it. You must have been doing about 80 miles an hour. I felt like I was doing Mach 10 all the way around. I wasn’t lifting. [Thomas] Covington, we had a good pace that first moto and I was just trying to break him. I had that pass or whatever but then he was still there, and then he went down. Then I had my mistake, but that second moto was brutal. Not an easy track to pass on. If you look at the qualifiers from yesterday, a lot of the guys, Herlings passed Cairoli, but kind of everybody stayed the same. When you were behind Thomas in the first moto, I noticed you were going about 50 feet longer in each corner because you were going inside to try to get by him. Did you feel like it was tough to pass? First moto I didn’t start second. I started, I think I was seventh the first turn. By the time the first lap ended I was second. So, yesterday yeah, I felt like I was on a pit bike yesterday so it was hard to pass. But today the track was brutal. Maybe not for them, but for me it was pretty rough. It was probably one of the rougher ones that I’ve done this year. I think it’s worse than Southwick. Definitely it’s worse than Southwick. Honestly, it came around today, though. The track was good. I think everybody did a really good job. First podiums, a win here, but I really wanted it done this season. Yeah. Hopefully we still get a bonus for this. Yeah, I don't know. There’s no purse money. Second moto, you looked like everything was in control. You got the holeshot. Everything was in control. Then here comes the Suzuki guys. So, your pit was telling you, hey, pick it up? Yeah, well, again I expected them to fade pretty bad. I got that start. We had a pretty good pace early, but I just kind of expected Covington to fade back. Whenever he did, I got that six or seven seconds. I was like, all right, good. I kind of calmed down and I just stabilized that. Once I seen these yellow things coming I’m like, man, what is going on? They got Covington fast so I was like, oh man, we got to pick it up. But I didn’t want to go fast, but if I had to, I still could have. That’s what we train in. I was hurting. I’m not going to lie. I almost passed out down there after the race. But it was fun. What a day. Yeah, you were really good right from the start. It looked to be your day. Cool to hear the National Anthem up there. It’s not something we do at Nationals, but I was thinking watching you on the thing, that must be a pretty cool moment. Yeah. Not even that, I haven’t raced anything like this. We have American flags waving all in the back. The fans were nuts. I got so many fans here. I only live two and a half [hours], almost three away. That was cool, hearing the National Anthem. I was so hot up there, I was honestly about to pass out so I didn’t really listen. But it was cool. You don’t know what it’s like though until you show up and race these things. I didn’t really know what to expect. Everyone I talked to was like, “Take it easy Saturday. Take it easy Saturday.” I didn’t mean to do that yesterday. I was trying to go fast, and I wasn’t able to. Actually, I went to Waka Flocka last night [Saturday]. I’m not going to lie. I didn’t get to bed until like 11:30, 11:45. Waka Flocka almost got you. Yeah, that’s what I’m saying. I was like, we’re 30-something gate pick anyway. We might as well go to Waka Flocka. So we went down there. We were laughing about how you’re never around after the Nationals, which I like that you left your wallet at Indiana. I felt like that was revenge for you not talking to the media. Let’s talk now about your season. You had some bike problems, there’s no doubt. You came in missing some time, but there was speed almost always there. Were you happy with the season? Yeah, I was. I was pretty beat up from my ankle. I got back from that and we could have made round one, but I think I was on the bike two days before that so I was like, I’m at this point now, I’m coming into my third year, we need to do something special. So I talked to the team. The team told me, they’re like, whenever you’re ready. So, I went out to California and got passed by amateurs right before we went racing. The next week I was going racing and I went to a California track and I was getting passed by amateurs. So, that kind of destroyed me. Then we showed up at High Point, good starts. The bike’s better. That’s the main thing, I think. I didn’t change a bunch of my program, but our bike’s way better. We were strong. We had those bike problems. I came back from the injury. If we’re healthy, I think we can definitely get things going. I want to be able to battle next year. Supercross too. I feel like I’m more of a supercross guy but I haven’t really showed it at all. So, that’s my only podium, but I’m happy with where we are. Dan’s first time over here. Got him a win. He’s stoked. Ziggy got all emotional. He was crying and everything today. It’s cool. It’s good feelings. I wish I could have done this for them earlier, but it feels good. The whole team, we haven’t had this in a little while. Since my amateur [career] and then I showed speed and then I got hurt pretty bad. We haven’t been back until these last few outdoors, but 1-1 on today. Great way to end the year too, right? This is going to be your last race of the year? Yeah, exactly. We’re not planning on doing any off-season things. I want to stay healthy, get ready for supercross and give these guys what they deserve. I’m happy though. Stoked on the day.